Tesla Model S usurps Mercedes S-Class as king of European luxury flagships. The winds of change are blowing through Europe. After years of playing the plucky American underdog, the is now a market leader in European luxury car sales in its segment. 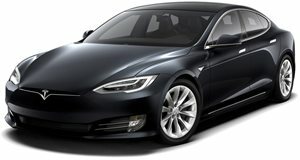 Tesla sold 16,132 Model S sedans in Europe last year according to JATO Dynamics, a jump of 30 percent and solidly ahead of the Mercedes-Benz S-Class (13,359) and BMW 7 Series (11,735). Tesla sold almost double that in the US, estimated at over 28,000, which is also almost double the nearest full-size luxury sedan competitor, again the Mercedes S-Class (15,888). Then again, those brands and the other premium marques have a few other cars in their lineup, while Tesla is essentially a two-model lineup. The E-Class and 5 Series and SUVs are a different story. In the SUV market the Model X still has a ways to go to take over top spot, with about 24,000 deliveries in the States and 12,000 in Europe, which might top the Porsche Cayenne, but is nowhere close to leaders like the BMW X5 and Audi Q7. The Tesla Model 3 has not yet achieved any significant production volume, so Tesla remains a small player in the luxury scene compared to Mercedes, BMW, and Lexus, each of which sold over 300,000 vehicles in the US alone last year. However, the appeal of the and Model X among shoppers spending over $100,000 has left luxury brands playing catch up in the electric vehicle market. Seeing Tesla outsell their flagships in their own backyard is a wake up call that will push them to bring their electric programs to market even quicker Speaking with , Felipe Munoz, an analyst with market researchers JATO Dynamics, said, "This is an alarm for the traditional automakers such as Mercedes. It says a smaller but smarter brand such as Tesla can beat them at home." While the is all well and good, Mercedes needs its EQ brand to get here, stat, same for Audi’s upcoming E-tron products, and BMW needs to offer more than a small, goofy hatchback with limited range to capture EV intenders before Tesla starts delivering the affordable Model 3 in the quantities Tesla keeps promising.